Frank Textbook Solutions are considered extremely helpful for solving difficult questions in the ICSE Class 10 Chemistry exam. TopperLearning Textbook Solutions are compiled by our subject experts. Herein, you can find all the answers to the questions of Chapter 9 - B - Nitric Acid for the Frank textbook. (i) Aqua regia is a mixture of nitric acid and hydrochloric acid. 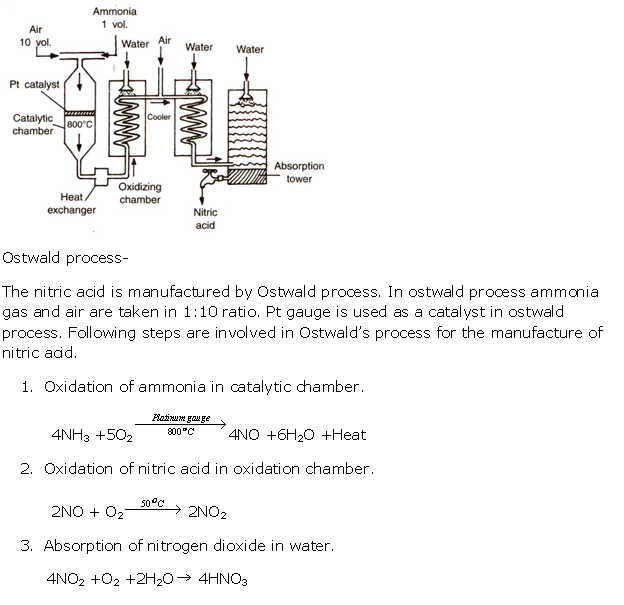 (ii) Fuming nitric acid is obtained by dissolving excess of nitrogen oxide in conc. nitric acid. (iii) 98% nitric acid is obtained by distilling 68% nitric acid with conc. H2SO4 under pressure. (iv) Ammonal is a mixture of ammonium nitrate and aluminium powder. (i) The complete apparatus should be made of glass only. (ii) At high temperature, nitric acid decomposes and the glass apparatus may get damaged. Sodium formed at a higher temperature forms a hard crust which sticks to the walls of the retort. Brown fumes of nitrogen dioxide are produced. Copper reacts with concentrated nitric acid to produce copper nitrate, water and nitrogen dioxide. (i) When sulphur is treated with conc. nitric acid, it produces nitrogen dioxide. (i) Dilute nitric acid is generally considered a typical acid except for its reaction with metals because it does not liberate hydrogen. It is a powerful oxidising agent, and nascent oxygen formed oxidises hydrogen in water. (ii) Although pure concentrated nitric acid is colourless, it appears yellow when left standing in a glass bottle due to the dissolution of reddish brown nitrogen dioxide gas in the acid. Nitrogen dioxide is produced because of the thermal decomposition of a portion of nitric acid. (iii) An all-glass apparatus is used in the laboratory preparation of nitric acid because nitric acid vapour corrodes rubber and cork. (i) Cold, dilute nitric acid reacts with copper to give nitric oxide. (ii) Hot, concentrated nitric acid reacts with sulphur to form nitrogen dioxide. TopperLearning provides step-by-step solutions for each question in each chapter in the Frank textbook recommended by ICSE schools. Access Chapter 9 - B - Nitric Acid here. Our Frank Textbook Solutions for ICSE Class 10 Chemistry are designed by our subject matter experts. These solutions will help you to revise the whole chapter, so you can clear your fundamentals before the examination.